The Chevrolet Camaro has left one hell of an impression on the automotive world and it will be receiving the recognition it deserves. 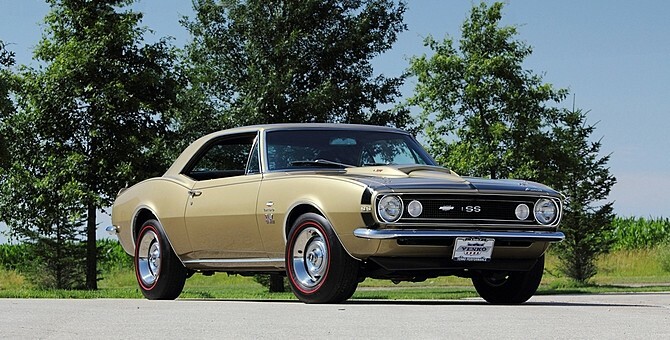 The Detroit News reports the first production Chevrolet Camaro, a 1967 model, will be added to the National Historic Vehicle Register in Birmingham, Michigan. The association’s president, Mark Gessler, stated it will be the 15th car on the list association’s list. The news runs parallel with the iconic Woodward Dream Cruise and the Chevrolet Camaro’s 50th birthday. For festivities, Chevrolet plans plant tours of the Lansing assembly where the Camaro is assembled and displays throughout Woodward to honor the Camaro’s lineage. The above photo has a Corvette hood scoop? Top photo shows a Grenada Gold ’67 Yenko Camaro. Photo further down and to the right shows a standard Grenada Gold ’67. Car is missing the “Camaro” emblem and the engine emblem on the fender behind the f/wheel opening. Perhaps early production cars weren’t equipped with them. Anyway, I’ll take the Yenko……..